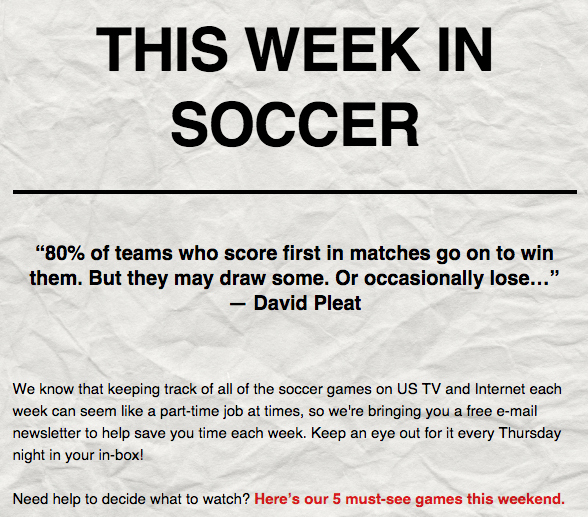 Beginning today, you can now receive a comprehensive guide to the weekly soccer TV and Internet listings with a free newsletter delivered to your email in-box every Thursday night. This Week In Soccer features TV and Internet listings for the Premier League, MLS, La Liga, Serie A, Liga MX, Bundesliga, Ligue Un, UEFA Champions League, international games, Championship and more. Instead of dealing with confusing schedules or annoying TV guides, subscribe to the e-mail newsletter and get everything you need in one simple e-mail each week. Subscribe today so you don’t miss out. Note that the soccer TV and Internet listings are for United States only. Check out the preview of the debut issue of the e-mail newsletter. Oh, man, what a great idea! Thank you, this is something that will be *really* helpful. Now if I can just get comcast to carry Fox Sports 2 and BeIN Sports in HD! Keep on contacting your local Comcast office. It’s on a regional basis. My Comcast carries beIN SPORTS in HD.